I believe I already did this several years ago and my post was questioned by somedickbadlam. Okay, I am ready for another delete. Checkbook converters don't belong here. I strongly disagree with that premise. Anyone who thinks they are a Busnut, is a Busnut, whether a bus is just a gleam in their eye which will never really happen, or a million dollar factory conversion, or anything in between. If you think you belong here, then you belong here. Welcome. I don't really understand the post. However, if you can't pay to have somebody else do work on your coach, to be on the board, count me out. We have paid a lot of people a lot of money during our conversion. Does that mean I shouldn't be on? I don't think so at all. MikeK, the guy who owns this board, sell converted coaches. Should his customers not be allowed? But I still don't think I understand your post, since I doubt that is what you were saying. Hey Tom, nice chatting with ya yesterday In PB, when you hover (lol helicopter terms ) yer mouse (now that would be a strange sight to see ) over the pic you want to post the box will open wit da codes copy the "image code & go back and paste in yer post, make sure there is a space before and aft of the link Pictures turn out the best here at 640 x something or another. Huh! what I miss now! Everybody is welcome here. It doesn't matter whether they are hands on with all the conversion and bus systems or just love owning and driving one, or even people who don't even own one yet. Where do we draw that line? We didn't "make" our buses in the first place. We paid for an already built bus. 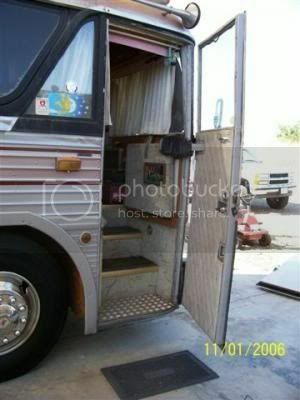 The club is entitled "bus conversions bulletin board" not "bus converters bulletin board" so that would include anyone interested in, or owning a conversion. My wife and I have single handedly converted our own bus entirely ourselves with an occasional weld done by a friend who is certified, but from a seated coach to a converted coach full out with 9 inch roof raise and full interior/glass shower/washer and dryer/twin 100 gallon holding tanks, etc....but I don't feel like I'm better than the guy who paid to have it done. I'm just glad I know every square inch of my bus, plumbing, electrical, frame, and engine. But certainly I have never entertained the notion that someone who paid to have a conversion done wasn't welcome here. If that's the case, I'll find another club to join. I would hope this one is open to anyone. This is America. Love viewing this thread every so often to see what new peeps have joined and what their coaches look like. Keep it coming! Hmmm. I paid with my checkbook for some of the parts I used in my conversion, so does that me me a checkbook converter? Even those who do not yet own buses, (as was my own case for many months), come here to learn all they can before they purchase a bus. For me, I learned enough to choose the right one for us and our budget. In my humble opinion, these forums should continue to be open to anybody interested in the subject of bus conversions. Wow I thought this thread was supposed to be about pictures not who belongs and who don't! But while were at it I guess I don't belong because my check book wouldn't cover the cost of paying someone to take pictures of a bus, and I have no converted bus either. Since I don't have a bus conversion to work on, or pay someone to work on I guess I'll have to find "seated charter bus forum" to join. ATTA BOY Dave! That things looking awesome! Painted this bus white July 1012. This bus is for sale. Snow disappeared......Now where did I put that bus? Hi All, I am one of the new people, and it's really nice to see all the creations here on the site so I will add just one more to the mix. Hope to chat sometime.